Dads play an important role in getting the next generation of hunters interested and out in the woods. It takes almost as much skill to get the kids out there as it does to make that shot and harvest an animal. There is the concern over getting cold, keeping their attention and talking about what it means to kill (and then eat) an animal. 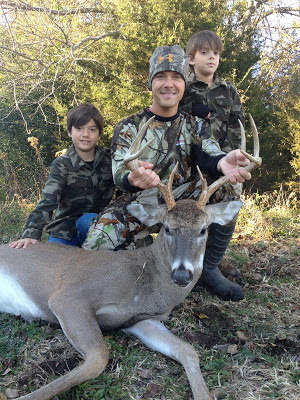 In honor of Father's Day and all of the great outdoor Dads, I thought that it would be perfect to hear how Bryan includes his sons with his hunting and the excitement they had this past deer season when the boys were with Bryan as he shot his first buck. I have interviewed Bryan before about hunting, fishing and getting his kids involved from an early age but his dedication and his son's trust in letting Dad drag them out of bed at 4:30am is impressive. I talked to Bryan when he shot this impressive deer after Thanksgiving. Q: Congratulations on an impressive deer! How many days did it take to be in the right spot at the right time? This was the third season that I have been out deer hunting. I've seen a few and taken a couple of shots but have always left empty handed. Over the Thanksgiving holiday, we were planning on going out Friday and Saturday. Friday morning, we did some targeting and our plan was to head out in the afternoon to see if any deer would come in before dusk. I think it was around 1pm when Glen (Roberts) sent me a text and said to get over to his place asap! In the field in front of his house, he said there was a 9 pointer out chasing does. My car was in the shop, so I borrowed my wife's and grabbed the boys and we headed over. When we got there, I started crawling on the ground, like army style, to get along a line of trees that would give me enough cover and let me get close enough to this deer to make a good shot. It was probably 120 or 130 yards. Man, I was so excited. Here is this beautiful deer and after all of the hours that I put in, I really wanted him. I was shaking and breathing heavily but I got into position and set my gun on him and shot. It was a good shot, but because I was moving more than I should have, it missed. So, I took some deep breathes, calmed myself and shot again. That shot dropped him! Q: Were the boys excited about being out in the woods? They were. This was probably the 6th or 7th time that I have taken them out. We are usually up and in the blind around 4:30 am and they bring blankets and lay down on the floor. My youngest is really into it. My oldest is only sort of interested but I'm working on him. After I dropped the buck, they came out into the field with me to help dress him. 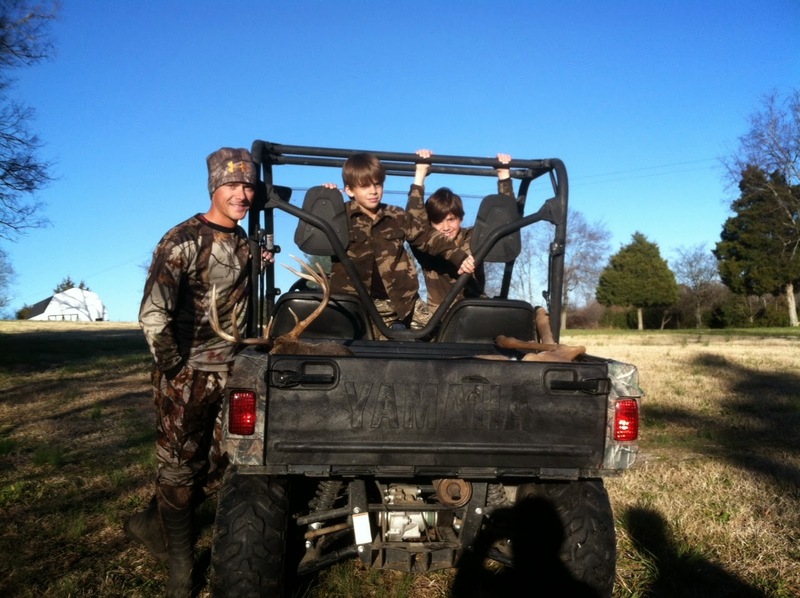 They were so excited that their Dad had shot this deer and that they were there to see and hear the shot. It was fantastic. Q: How do you keep the kids interested while out in the blind? I let them use the blow calls and rattle antlers. Q: How big was the deer? It was 162lbs and had a 17 inch spread. I shot it with a Mossberg 270. Q: I have the antlers of my first and my biggest deer mounted. What are you planning to do with the deer? My brother wants me to do a European mount but I'm not sure. I am definitely going to do something with it to remember the hunt. Q: You have taken your kids out on other hunts, too, right? Yes. We do a lot of turkey hunting and my son was in the blind with me this year. We were there for maybe 45 minutes when a couple hens came out followed by two big toms. It was a great and surprisingly quick hunt. He loved it and was so excited to see the whole hunt from beginning to end. It probably spoiled him to be honest. Next time, he won't want to wait any longer than we had to this time. But, it is amazing to see them become more and more interested in being outdoors and hunting. My brother and I didnt get into hunting until we were a lot older, so it is fantastic to see them as excited about this sport as I am. Even my wife has said she is willing and wants to come out into the hunting blind to see what is it like. It will be a family affair before we know it! 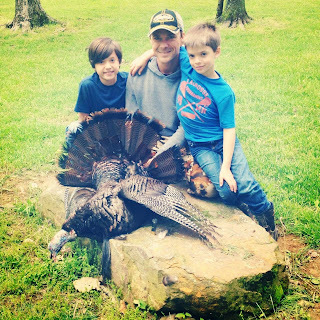 A big thank you to Bryan and happy Father's Day to all of the amazing, outdoor Dads who are helping to get younger kids interested in hunting and the outdoor world! Thanks for the shout out! !